I'm a salmon fan. I could eat salmon every day of the week. I don't, but I could. 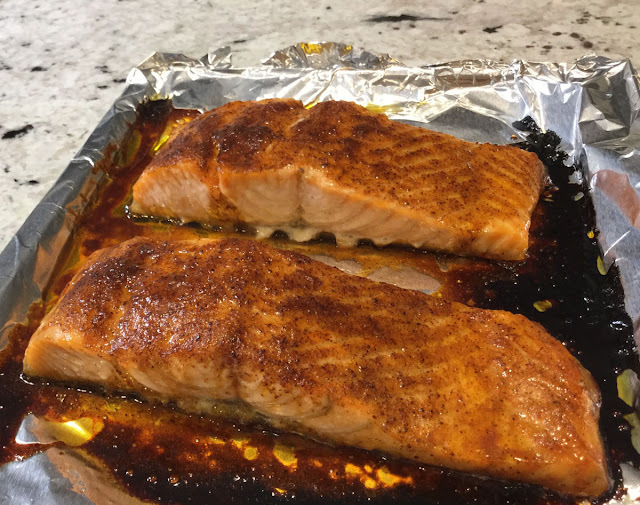 I know salmon isn't everybody's favorite, but eating salmon is so healthy for you that I encourage you to find a recipe or two that works for you. That way, salmon can be part of your menu rotation. My hubby isn't a big salmon fan. He eats it when I make it because he's good like that. Whenever I'm serving him salmon I use a recipe that packs lots and lots of flavor so he'll be distracted by the flavor and forget he's eating salmon. That's where this recipe began. 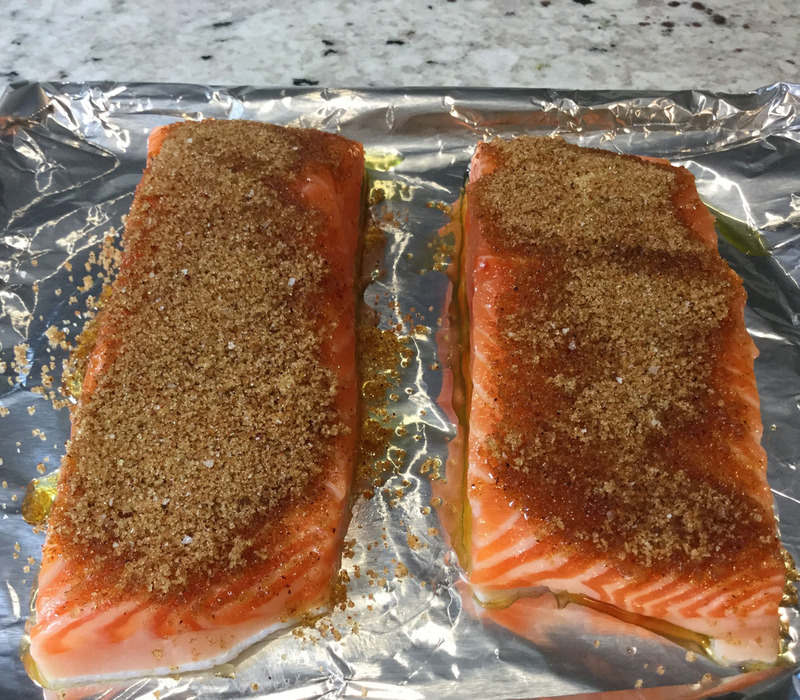 I was making salmon for Hubby and me and I wanted to change it up a little. The recipe is so easy I'm a little embarrassed to even call it a recipe. I think it is a little different, in that the combination of ingredients for the topping is not one you might usually think about making. This sweet and spicy topping, made with brown sugar, chili powder, and cumin can be addictive. 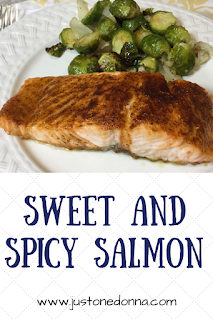 For those of you who are salmon lovers, like me, this recipe will make you happy, happy, happy. For those at your dinner table who may not be salmon enthusiasts, this recipe might make them ask for seconds. While we're talking salmon, I want to tell you about my favorite kitchen tool for cooking salmon. It is a fish spatula. A fish spatula has a flexible, over sized head with a beveled edge that slips easily under delicate foods. The head is slotted which makes it perfect for draining foods. My spatula is a LamsonSharp Pro fish spatula. It's pricey for a spatula, but if you check around you may be able to find one that would work as well for less money, like this OXO fish spatula. Just be sure the front edge is thin and sharp. It makes scooping the fish off your pan or grill without any skin attached as easy as can be. You'll also find this spatula to be a perfect tool when baking cookies. Preheat your oven to 425 degrees F. Mix together the brown sugar, chili powder, cumin, and salt in a small bowl until well combined. Set aside. Cover a baking sheet with aluminum foil for easy cleanup. Drizzle a little olive oil onto the foil. Place the salmon on the pan, skin side down. Spoon the brown sugar and spice mixture onto each piece of salmon, dividing the brown sugar mixture evenly among the salmon pieces. Place the salmon into your oven on the center rack. Cook until the salmon reaches your preferred level of doneness, about 20 minutes for medium. The sugar in the topping will bubble and melt from the heat of the oven. This is why you want to cover your baking sheet with foil. Let the salmon sit for five minutes before serving. We had our salmon paired with oven roasted Brussels sprouts. 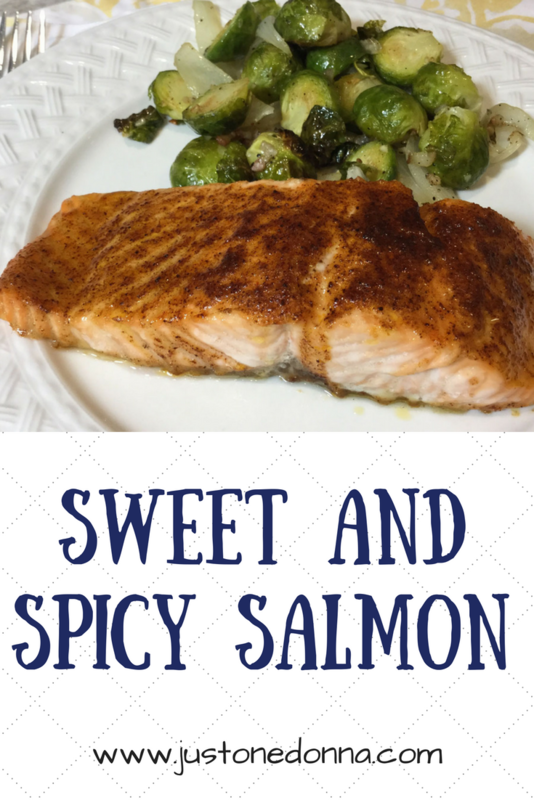 Brussels sprouts are perfect with this salmon. 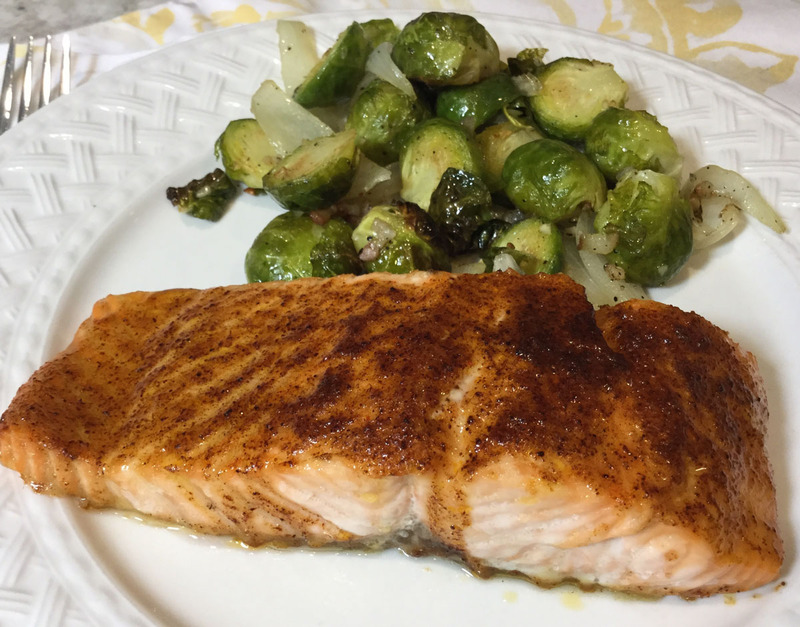 The Brussels sprouts cooked in the oven along with the salmon and both were ready at the same time. Before you go...Never miss a Just One Donna post by signing up to receive posts in your email or your favorite RSS feed. Links are in the sidebar. Like you, I could eat salmon every day. This looks delicious! Delicious and easy, Lydia. Perfect for any day you don't feel like cooking.